Logain Industries FDN is a fully integrated, scalable freight management, storage and distribution solution able to support the production infrastructure of any organisation. Using Point to Point Faster than Light Transference FDN will optimise freight distribution to both production platform and trade outlets. FDN Nodes use data provided by Advance Satellites to maintain its network. FDNv7 requires Community Plugin Configuration by Cycrow. The LI_MOD.cat & .dat files can be placed in the mods folder or renamed to follow the game .cat and .dat files. Many thanks to all who have tested and have contributed with comments & suggestions on this post, and the people who have answered my many questions. FAQ post started for v7. FDN is a fully integrated, scalable freight management, storage and distribution solution able to support the production infrastructure of any organisation. Using Point to Point Faster than Light Transference FDN will optimise freight distribution to both production platform and trade outlets. Nodes are the heart of the Freight Distribution Network and act as a centralised hub for the collection, management and distribution of wares to and from elements within their sphere of influence. The player will require increasing standings with a race to buy each Node. Nodes will automatically communicate with other Nodes that fall within their sphere of influence. 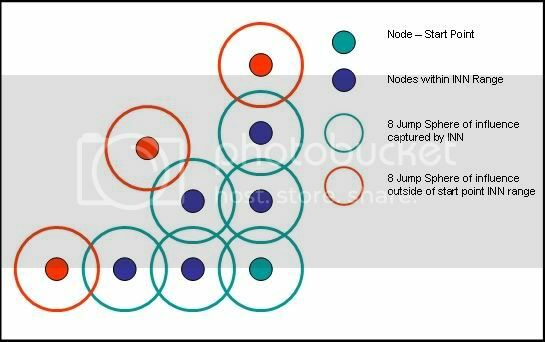 Inter Node Networking has a range of 8 jumps and the Node will communicate with Nodes within this range, they will also have access to all FDN enabled element visible to these Nodes. This includes other Nodes; however INN will not extend past this limit. In this example all Factories, Docks and Relays within 5 jumps of the three linked Nodes will be visible to and able to communicate to all three Nodes. Any Factories, Docks and Relays outside of this range will not contribute to the network. Any Nodes outside of the Node range will not be part of the same INN. This example shows the INN range limitations. Enable Remote Access: This enables Docks & Relays within range of the Node (or via INN) to request the particular ware from the FDN network. Resource distribution to production factories is the core feature of FDN, all other features and functionality are secondary to maintaining production supply. Factories will automatically select the closest FDN Node as its primary choice, however the player can also select which Node should be the factories primary Node. If the Node is no longer available (destroyed or turned off) the Factory will try and re-establish a link to the next closest Node. If the first choice Node cannot supply requested wares the Factory will query other Nodes within range and via INN. FDN will try to maintain a resource level of 2 * amount required per cycle, If FDN is required to buy the resource this level drops to 1 * amount required per cycle. For Complexes FDN will maintain 2 * the highest required amount per cycle, again if FDN is required to buy the resource this level drops to 1 * highest amount required per cycle. 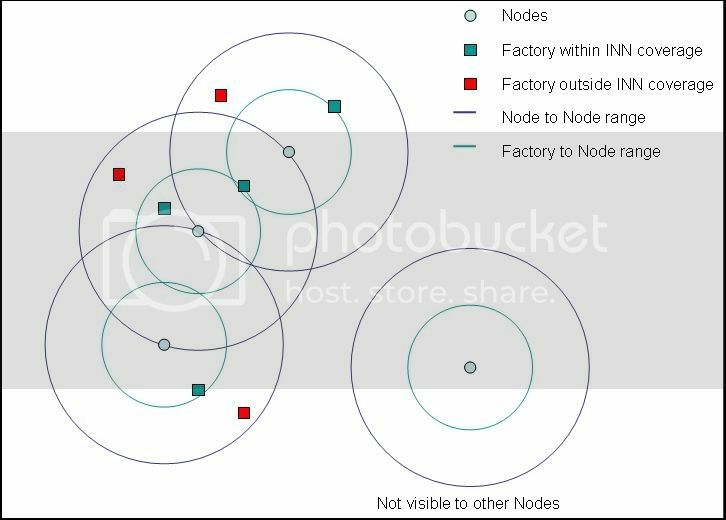 FDN is capable of supplying factories from multiple Nodes over a considerable range (via INN), however such de-centralised distribution will increase CPU requirements. FDN will work exceptional well only if resources are available and is not a silver bullet to an un-balanced supply and demand. Show Advance Link options will show the Primary linked Node and allows the palyer to set their own from the available Node. The player can manage the wares held at a Factory and dictate at what volumes products & intermediate products will be released to FDN. Minimum levels can also be set against resources. FDN Trade Posts give the player a trading presence without exposing the FDN Nodes (and therefore the FDN Network) to NPC traders, minimising the risk to production critical resources. Trade Posts will automatically select the closest FDN Node as its primary choice. If the Node is no longer available (destroyed or turned off) the Trade Post will try and re-establish a link to the next closest Node. If the first choice Node cannot supply requested wares the Trade Post will query other Nodes within range and via INN. The Trade Post has a fixed storage capacity of 5,000,000 units. Trade Post can sell wares as defined by the player. Unlike Nodes the Trade Post can only sell wares to NPC destinations within 3 jumps of its local Sector. The Trade Post does not have access to INN for selling wares. FDN Relays allow the player to re-supply ships with Energy, Missiles and Ammo based on the ships supply settings. Relays will automatically select the closest FDN Node as its primary choice. If the Node is no longer available (destroyed or turned off) the Relay will try and re-establish a link to the next closest Node. If the first choice Node cannot supply requested wares the Relay will query other Nodes within range and via INN. The Relay will only scan ships if they have Supply Command Software installed. The Relays will also scan ships docked at Carrier class ships. FDN uses Advance Satellites to maintain its network coverage; all sectors including sectors hosting Nodes require an Advance Satellite. The loss of an Advance Satellite will cause any existing linked elements to lose connectivity with the network. All other aspects are identical to the Trade Post. FDN has been designed and built to use a modified HQ as its Node; this was done purely to provide adequate storage units to support centralised collection & distribution. However the new build allows players at add any Dock as an FDN Node giving then the option to use other Dock mods or even vanilla Docks as Nodes. Previous version required LI_Mod files to work; the new version will work as a script only version, but limited by available storage. The game will only recognise the last HQ type dock deployed when saving Blueprints to the player HQ. This is an issue for any Mod using modified HQ docks to provide usable storage to the player. To overcome this limitation FDN v7 and the accompanying LI Mod v7 employ the same solution as Enhanced Equipment Docks by Saetan. The Mod file now contains two references for each LI station, one designated as an Equipment Dock and one as a HQ. The Equipment Dock is a dummy ref which is installed at Shipyards for purchase and deployment by the player. When the player opens the FDN Main Menu or Configuration Menu all player docks are checked and if there is a dummy dock deployed it will be replaced by the appropriate HQ version. After you built a LI Station you will be able to buy blueprints. But only the player headquarter can save blueprints, so if you don't have one, this blueprints will be lost. As already stated the Blueprint fix is used by Saetan’s Enhanced Equipment Docks and thanks go to him for pointing me at the solution. Thanks must also go to Lucike who came up with and developed the solution. There is a potential issue adding custom stations to existing race Shipyards, by which tradable items become unavailable to the player and the Shipyard show no items for sale. Once a Dock type as been added FDN will rcognise it and all the related FDN features & functionality will be available to that Dock type. A Dock type can only be classed as one FDN enabled element at a time. A Production Complex type Dock could be eanbled as an FDN Node which would allow it to be directly linked to supplying factories. 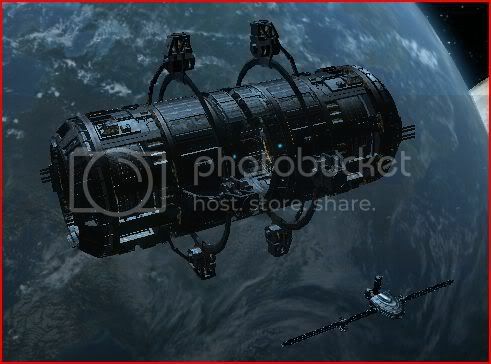 A Military Outpost type Dock could be anabled as an FDN Relay which would allow it to act as a re-supply base for player fleets. The only real limitation in using vanilla Dock types is storage. Equipment Doack & Trade Posts can only hold a limited amount of any ware, this would limit a Node which could be supply high tier production factories which require more of a given ware. This could be overcome by using multipule Docks, however this would require increased CPU usage. The configuration menu allows you to enable FDN features on vanilla or other custom docks. You can turn on/off dynamic update menus for the Main Menu and Node Menu. Debug logging can also be turned on/off for the main supply processes. FDN can also be fully reset from this menu, this will terminate all FDN tasks and clear all local & global variables. FDNv7 now includes two scripts to allow 3rd party scripts to request wares from and pass wares to FDN. The scripts aim to give other scripter’s safe access to FDN without the need to write their own code and can be called from both Stations & Ships. Last edited by Logain Abler on Mon, 25. Apr 11, 14:29, edited 355 times in total. See, I was tryign to figure out how to make it to build Terran complexes (with ATF Shipyard script), since they do not have nodes. Hopelessly I didn't find anything that could do such a thing and I was already to buy a huge fleet of 20 Baldrics (I role-play Terran-only) and thinking how the heck could I transport them from the Moon to Brennan's Triumph. I was about to buy a couple or three M7's as escorts even! This will surely be way more easy, and just have to have 2 TS's per sector which will help CPU and framerate a lot. I've always thought it was silly, having teleporter devices to have to connect everyhting with pipes. Just one thing... woudln't it be fair to have to pay somethign to activate such a useful device? Like... calculating the cost you'd have to pay in pipes and adding a small "fee"? Also. SPK format would be great. Anyways, gonna try this right _now_ Thank you! Seathal wrote: Also. SPK format would be great. Hm.. Okay nevermind. There's an SPK archive in it. Great. This is sweet! This is a great solution for the intermediarybetween, say, two complexes. I'm building an e-cell complex right now that will supply my other complexes later, and having this would be a great way to link them together. I've got a couple of suggestions. It needs a cost definitely, but I think the system might benefit from some sort of tactile action happening in the game, to actually 'show' the resources being moved. In complexes for example, the cost lies in the action of setting up the pipe, and it makes sense that a hard connection would provide the most streamlined way or exchanging resources. Even if teleporters are a part of the X-universe, the technology doesn't strike me as one that would be efficient or cost-effective for transporting large amounts of resources like this, especially if stations have considerable distance between them. It works great. No hassle, just activate the option and voila. This allows me to link my Terran factories even without nodes, even better, without pipes nor spaghetti-looking complexes. Just a nice row of forges aligned. Great script anyways, 5 stars. This looks great, but I'll probably not install it for a while yet simply because it can't transfer resources to a PHQ which is the only reason I'd really need it with the complex cleaner addon. A cost would be nice as well, but you've said you're working on both of these things so this looks like it could be a great script. I’ll certainly be adding a cost, I’m thinking along the lines of when a sector is added. Last edited by Logain Abler on Tue, 30. Dec 08, 16:47, edited 1 time in total. Any issues, bugs & faults please let know. Add cost. There is no cost at the moment but once I’ve added all the planned functionality there will be a cost when FDN is started in a Sector for the first time. FDN for PHQ and maybe FDN for PEQ. Auto Missile Supply. Same function as the e-cells but for Missiles. Sounds very nice, and the script's one of the most useful ones I've ever tried. Congratulations! So glad you like it & it's not a waste of time. Ya know, I dont think i tested complexes fully in earlyer versions. All of the ones i had going were self supplying. Me bad there. Any chance of extending this to multi-sector ? Perhaps by including a ship that jumps to another sector to get what is needed in the home sector, and when it jumps in, it beams to whatever station needs what it brought. The main thing I'm thinking of here is where you have different complexes in differnet sectors, all specialised. So in one sector you make ecells. In another cahoonas, in another silicon, in another ore. etc. So your ecell sector needs silicon, it has a home based ship that jumps to your silicon producing sector (with a load of ecells) and gets a ship full of silicon and returns and beams it onto the ecell complex. Meanwhile your gun complex has ships doing the same to get ore and ecells and cahoonas. Even better if you can get it happening without having to assign a ship to a product, with the software just working out what is needed where and moving it. The whole transfer between your own complexes thing is sadly deficient and using the buy and sell commands is not an acceptable answer. I never wrote the script with Complexes in mind. it was written so I didn't have to use them, but there will be a lot of people who do. Had to script in lots of Complexes (12 over 4 sectors) to work on the script & test. Last edited by Logain Abler on Tue, 30. Dec 08, 10:05, edited 1 time in total. apricotslice wrote: Any chance of extending this to multi-sector ?. apricotslice wrote: Perhaps by including a ship that jumps to another sector to get what is needed in the home sector, and when it jumps in, it beams to whatever station needs what it brought. Great idea but there are a few trade scripts out there that do what you suggest, or similar, by people far smarter & far better script writers than myself. Just look at the great trade scripts by Lucike, CAG, CLS & EST. apricotslice wrote: The main thing I'm thinking of here is where you have different complexes in different sectors, all specialised. I see your point, one that I think comes down to how people play such a broad game differently. As I said above I have looked at multi Sector. The only way I would be happy to do this (and what I originally planned buy found beyond my current skills & available time) would be if there was a specialist FDN station/hub/node which acts as a distribution warehouse between sectors. Maybe in the far future & with lots of help from the community. apricotslice wrote: The whole transfer between your own complexes thing is sadly deficient and using the buy and sell commands is not an acceptable answer. The script if still an early version so I have to limit what I can safely publish. Last thing I want to do is screw-up peoples saved games.